Phil Harrington is a well-known astronomy writer and has published a lot of material about deep sky observing. He is well-known for Star Ware, his book Touring the Universe Through Binoculars and for various magazine articles, including in the late and much-missed Deep Sky Magazine. Cosmic Challenge is his latest and probably best work to date. The book arrived from Amazon a day after ordering it and is a quality book with an attractive dust cover. It’s a fairly heavy book but the paper is somewhat thin and has quite a bit of show through, i.e. you can see the text and pictures on the other side of the page which is a bit irritating. The Challenges are divided into chapters according to instrument size, beginning with the unaided eye and working up to ‘Monster scopes’. However, before we get to the Challenges, there is plenty of information about what we, as observers, need in order to meet these challenges. This chapter, Meeting the Challenge, is packed with information about the human eye, binoculars, telescopes, accessories, observing site conditions and techniques. All this sort of information has been published before but it is entirely relevant to the challenges that lie ahead and is essential in order to be successful in completing them. Naked-eye challenges, the first of the challenge chapters, speaks for itself. Try spotting some of these things with the unaided eye. Challenges in this chapter include M81 (which I have seen from TSP), Alcor and Mizar,M13, Young/Old Moons and so on. Barnard’s Loop, faint nebulosity in Orion is also in there and that’s something I am going to try this coming winter. Next up is Binocular Challenges, that is ordinary small binoculars such as my 8x42s. Subsequent chapters are Small-scope Challenges, Medium-scope Challenges, Large-scope Challenges and Monster-scope Challenges, all with their own special sets of objects to find. Each chapter is further divided into seasons. The definitions of small, medium, large and monster scopes in the book are interesting. ‘Small scopes’ are giant binoculars and 3 to 5 inch telescopes; ‘Medium scopes’ are 6 to 9.25 inch telescopes, ‘Large scopes’ are those in the 10 to 14 inch range while ‘Monster scopes’ fall into the 15 inch and larger category. Personally, these days, with ever-larger scopes in amateur hands, I wouldn’t describe a 6 inch as medium or a 15 inch as ‘Monster’; I’d call 8 inch and under ‘small’, 10 inch to 15 inch ‘medium’, 16 to 24 inches ‘large’ and 25 inches and above ‘monster’ but this is just me being picky – it’s all pretty subjective and isn’t a criticism of Phil’s categories. Actually it’s quite nice to see my own 18 inch Dob fall into the ‘Monster scope’ category – and to a lot of people a 16 or 18 inch telescope really is a ‘monster’. There are finder charts, photographs and Phil’s own eyepiece sketches for each object. I love to see sketches in an observing guide, simply because they are the best way to convey what you see in the eyepiece, something photos cannot do. The eyepiece sketches in this book are white-on- black, which is more realistic than the more usual black-on-white sketches, and give an idea of what you can expect to see through the telescope. Some of the sketches are so faint, e.g. those of the fainter galaxy groups and Simeis 57, that you practically need averted vision in order to see them properly – I am not sure whether that is intentional or a function of the printing process. Having looked at the sketches I think it is, in fact, deliberate that some are very faint because the objects represented in them are actually difficult to see in the eyepiece, while the sketches of the brighter objects are easy to see. 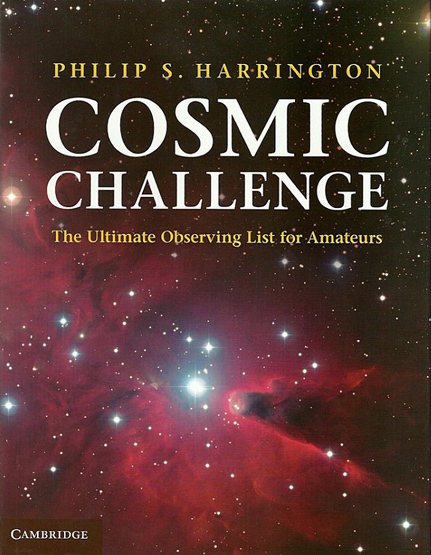 Through the chapters, the challenges range from the relatively easy such as M20 through binoculars to the fiendish, such as Hickson 50, a hideously-faint group of galaxies in Ursa Major and a challenge for even the largest of amateur telescopes with the brightest member having a magnitude of 18.7b. All-in-all this is an excellent observing guide, with something for everyone whether you observe with your unaided eyes or you have a 20 inch light bucket. It’s both very readable and a proper observing guide suitable for use during an observing session. Highly recommended.